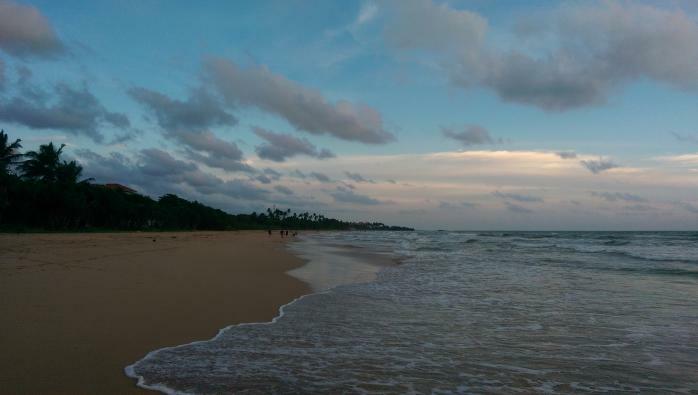 We stayed at the Centara Ceysands Hotel on the north end of Bentota Beach, which is a spit of sand between the Indian Ocean and the Bentota River. Using GPS and Google maps we thought we'd done well to find the little lane between two other hotels that headed toward the hotel. The lane returned to a sandy road on the edge of the beach, there was no choice so we kept going, it seemed a bit bumpy for a pretty fancy hotel. We pulled up at an imposing gate at the hotel that didn't look like a grand entrance. The security guard informed us this was the service entrance and no way to allow guests to enter, the arrival directions we'd not got from Expedia is that a boat service across the River is the correct way to arrive. This was a twist on the saying that "you cannot get there from here" this version was "you cannot get here from here". We bumped back down the beach, across the bridge to the neighboring town, Aluthgama, turned by the Police Station, through the guest gate and the grand lobby to the little shuttle boat to the check-in desk and welcome drink. Once settled it was worth the trip, very nice hotel and a fantastic day at the pool and beach. Coconut palms as far as you can see, warm ocean, warm pool, the coldest water was in the Jacuzzi. It was great to have a relaxing day, beach, pool, eating. The most hectic was getting a bucket of ice water from the pool guys for the ALS Ice Bucket challenge: we had posted video at the hot springs in Trincomalee, apparently hot water in a tropical country didn't count.